Basically I'll just listen to the show and take some before-after pictures. Thought it would be nice for Jen and Greg to see what other people paint while they entertain (and paint). Thoughts: Re-listening to the episodes is kinda weird. Funny that I forgot like 80% of what was talked about. Anyway Greg (aka G-Money - thank God Jen put a stop to this before it became a thing) in case nobody told you yet, the Shaggoth is in the SoM book. Would've been a real shame otherwise, the model is indeed very cool. I play an Empire army from Hochland (green-red) btw. So I try to tie these into the main theme by using darker variations of green and red. The red is done, I just started the green. Agree with your thoughts on Cav and Monsters. I decided the all red guy looked to much like he was partying out in his jammies so I painted over the lower part with brown. Green is done now, everything that's brown now will be painted as leather once I get around to episode 3. That's it for today, hope you like. I'm off to bed now (it's 3:23 a.m. on this side of the planet). I LOVE the way your skin looks on those models. The details on the faces are very easy to see well. The scars show up great. This is an awesome thread! 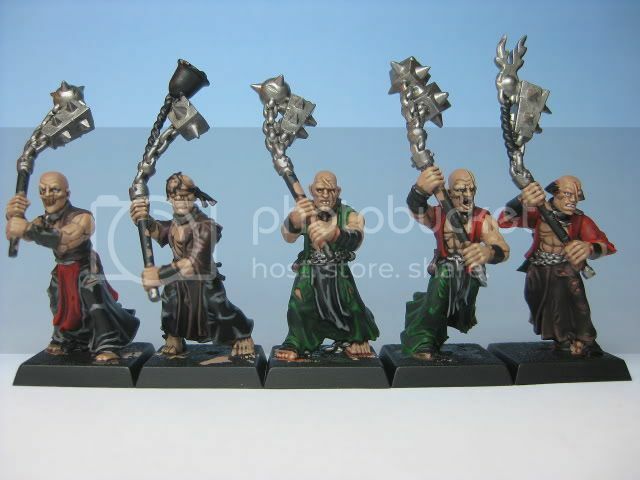 Your flagellants are coming along very nicely. It's interesting to see how other people approach their models. I usually basecoat then wash the entire model. Then I highlight each color/area individually. Quite different from your approach, where you work on a particular section before moving on to the next. The skin looks great - especially the eyes! I can't wait to see more. By the way, I did realize my error regarding the Shaggoth. In fact, I fielded one in the recent Storm of Magic tournament held at our local hobby store. Look for more on that topic on our Youtube page and in Episode 8. Jen and I also love having guests on the show. It makes recording and editing a bit trickier, but it improves the quality of the content. Look for the glorious return of many of our guests (and perhaps some new ones) in Episode 9. This is an awesome thread! 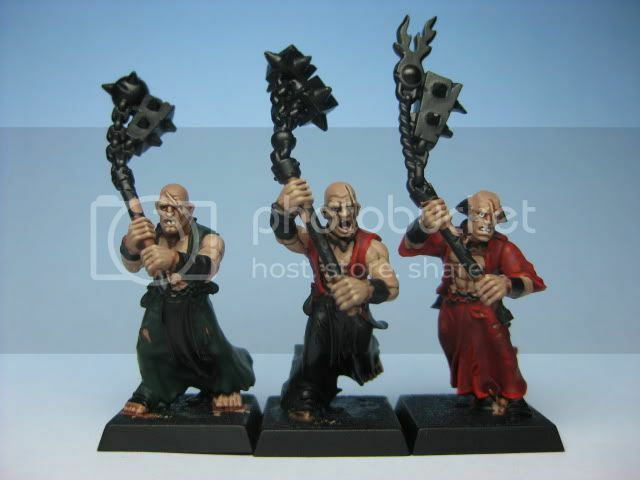 Your flagellants are coming along very nicely. It's interesting to see how other people approach their models. Thank you very much. In my gaming group I'm the only one who paints this way, it probably has a lot to do with my aforementioned bad memory. I tend to forget which parts still need doing, and there's nothing more disappointing than having to paint a mini you thought was already done. "Good news everyone!" I liked all your guests so far, so that's pretty cool. Tried some other forum code, we'll see if that works out. But let's move on to the painting part. Also Mike was a particularly cool guest, I hope he makes a comeback. I'll skip the before shot, cause I didn't touch the models after my Episode II post. 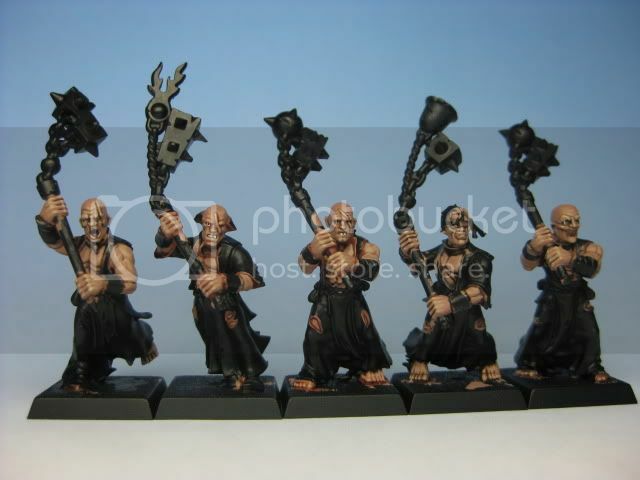 These guys look great, i've seen your plog on warseer and you've got a fantastic empire army! The skin in particular really pops,which has been a problem i've had while painting my empire army. Thx Peyton, I find skin particularly difficult too. Glad to know it worked out alright on these guys. So I had time enough to listen to episode 4 and 5, which was enough to bring this little project to its erstwhile conclusion. Thoughts: Another really cool guest. Tourney prep is a very cool episode topic, and has me all excited for my next tourney (which is in less than two weeks). Thoughts: Loved your take on starting an army, I'd definitely agree with everything, some good tips for new players there. Can't say I agree with the unit fillers though, but I'm not a huge fan of the concept per se. All I ever see are cop-outs, the put 3 guys on a base were 4 should go kinda deal. But I guess to each his own. I listened to both episodes back-to-back so I' not exactly sure in which episode this was mentioned, but is this the German terrain company you were talking about? And it's done. I have to admit I cheated a little bit, I paused Painting Tabled while the pva glue was drying (no need to waste precious time on that). The finished ones look great! They look very good. Agree the flesh tone is realy nice and the robes deff pop. 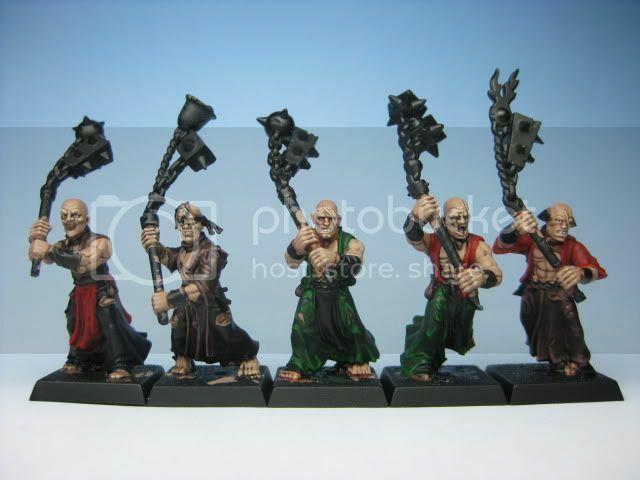 Fantastic work on the Flagellants. Are they being added to an existing unit? If so, can we get a group shot? Good luck at the upcoming tournament, let us know how it goes! Judging by the number of episodes you got through painting them, you spent a good deal of time for 5 guys. That said - it really shows. In a good way. Like everyone else pointed out too the skin is phenomenal. Care to write out explanation of how you achieved the effect? 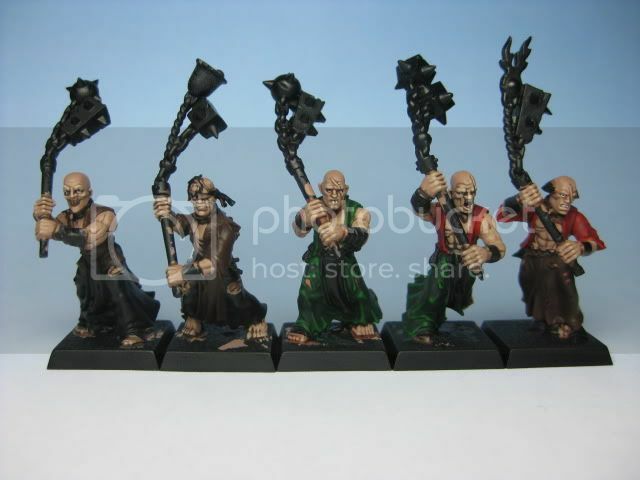 @Greg2thePerson: I have a total of 25 painted flagellants, but they are already packed away for the tournament next Saturday. I'll let you guys know how it went and take a group shot then. @JonathanVanase: Yup, sadly I'm a really slow painter. The skin is actually pretty easy. Then you paint over the elevated parts with Tallarn again, and highlight with a 1:1 mix of Tallarn Flesh and Bleached Bone. On the knuckles, the nose, chin and scars (if any) and on the "eyebrows" (I don't know the English word, I mean the part of the face on which the eyebrows lie but not the eyebrows itself) I painted a final highlight with the same colors mixed 1:2. 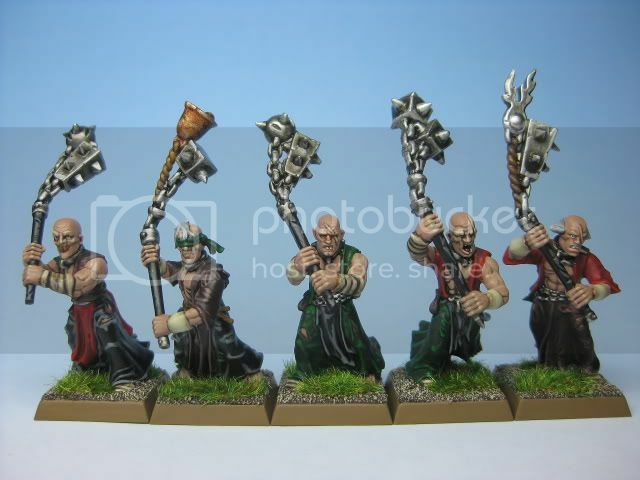 Wow, those flagellants are stunning! I'm definitely going to try out that skin color you use. On my Wood Elves I've been doing Tallarn Flesh washed with a mix of Ogryn Flesh and Gryphonne Sepia, then highlighted with more Tallarn Flesh, then a mix of Tallarn Flesh and Dwarf Flesh, then Dwarf Flesh, then a mix of Dwarf Flesh and Bronzed Flesh. Dwarf Flesh and Bronzed Flesh are actually very weird colors, so I haven't been thrilled with the effect. Can't wait for the group shot of the flagellants! Take some pics of your whole army if you can! Nice, those flagellants are really good. You're really taking the show to heart! I like the post listening to the show updates. Take heart though, I'm as slow, if not worse. I've just spent a week on a move tray and it isn't finished.